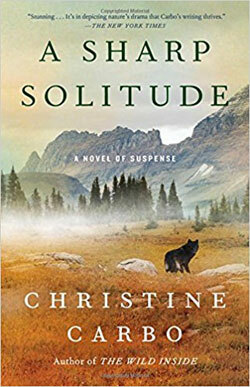 Montana’s Glacier National Park is a troubled place these days — almost as troubled as the characters in A Sharp Solitude, Christine Carbo’s fourth and latest mystery, set in the park’s shadow. Glacier faces the climate-change-driven loss of its eponymous glaciers by 2030, its forests are under relentless attack by pine beetles emboldened by northern Montana’s rising temperatures, and smoke from drought-related wildfires now cloaks the park many summer months. While the troubles facing the national park are all to the bad, those that haunt Carbo’s flawed heroes in A Sharp Solitude make for an atmospheric, suspenseful — and wholly captivating — character study of the finest order. Like Glacier’s climate-related travails, the psychological challenges faced by Carbo’s dual protagonists, FBI agent Ali Paige and wildlife biologist Reeve Landon, are not of their own making. But their questionable choices at the outset of the story most certainly are. Ali and Reeve have moved from New Jersey and Florida, respectively, as adults to the remote Flathead Valley outside Glacier National Park to escape separate childhood traumas. There, the former lovers are the wary co-parents of an adorable five-year-old. When journalist Anne Marie Johnson is found shot to death at a cabin near the national park, Ali and Reeve make impulsively bad initial decisions. Ali pockets evidence from a potential crime scene near the murder site in an attempt to cover for Reeve, while Reeve lies to police interrogators about his encounter, possibly sexual, with the victim shortly before her death. Ali and Reeve tell the tightly interwoven tale in alternating chapters from their respective first-person points of view. The choices the ex-lovers make at the start of the murder inquiry, and the harmful consequences that inevitably follow, provide Carbo the opportunity to explore the damaged psyches of adults facing — and too often failing to cope with — long-past childhood trauma. Reeve, who killed a playmate in a gun accident as a boy, proves himself the more fallible of Carbo’s dual protagonists. Faced with the decision to fight or flee upon being named a suspect in Anne Marie’s murder, Reeve chooses flight, disappearing into the brooding Glacier backcountry with his trusty canine research assistant, McKay. Ali, meanwhile, earns the gold star, as she willingly lays her life and career on the line in her fight to prove Reeve’s innocence in his absence. In true Montana fashion, grizzlies and gunfire figure into the dramatic climax of A Sharp Solitude. Through all the commotion, however, Carbo remains true to her primary theme, providing readers an engrossing look at a pair of imperfect but deeply sympathetic characters working to overcome psychological wounds suffered decades earlier. Scott Graham is the National Outdoor Book Award-winning author of the National Park Mystery Series for Torrey House Press. The fourth book in the series, Yosemite Fall, was released in June. Visit Graham at scottfranklingraham. com. From August 2018, Prose and Cons.